The reflexive process introduced in Reflexive Team Supervision is distinguished from a systemic shadow consulting process as formulated by Peter Hawkins. What is this difference? The secondary process of workgroup activity, whether in the shadow process or in the client relationship, is the context within which the primary process is made manifest. The role of the shadow consultant is to enable the consultant to prevent primary processes in the consulting team getting in the way of effective intervention. It is experienced as the particular form of its relationship to a Lacanian ‘more’ that is symptomatic of the interests of the sponsoring system – organisation as symptom in the sense of Freud’s third identification. If we refer to this ‘more’ relationship as a relationship to what is Really going on (wiRgo) in the sense of a relationship to the Lacanian ‘Real’ beyond the Kleinian object relationships underpinning wigo, then a reflexive process is one that seeks to make this relationship to wiRgo accessible to the consulting process. What then is the difference? Parallel process is a necessary but not sufficient condition for a reflexive process. Parallel process surfaces the Kleinian objects of primary process implicit in the way the consulting intervention unfolds. 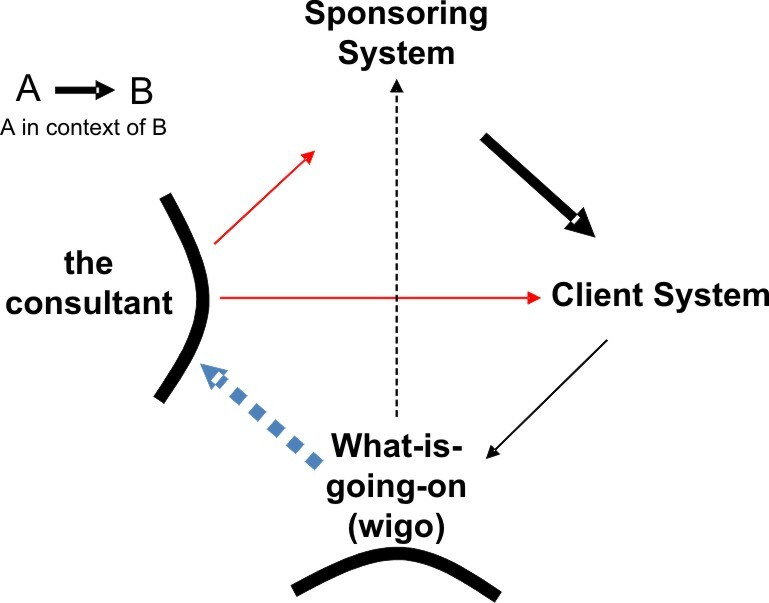 Reflexive process aims to build on this by accessing the symptomatic nature of the relationship to a Lacanian ‘more’ implicit in the organising assumptions of the sponsoring system, in order to inform the direction of the consulting intervention itself. The wigo/wiRgo difference between object and symptom is thus a yang/yin difference. French and Simpson describe this approach to effective workgroup mentality in their more recent paper on redressing the balance in Bion’s Experiences in Groups. This relation to a Lacanian ‘more’ is implicit in the different treatment of the subject’s relation to primary phantasy by Klein and Freud, discussed in an earlier blog on the Kleinian vs Freudian theorisation of organisation.